Wood or butcher block countertops offer a attractive warm look and is available in a wide range of colors and finishes. 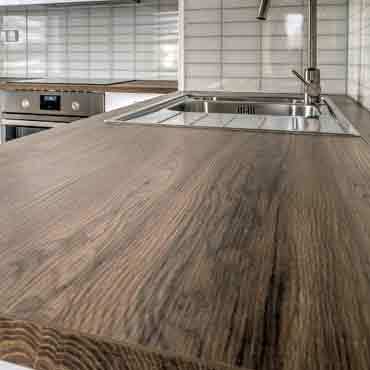 Hardwoods such as oak and maple are frequently used as countertop woods. Wood countertops are smooth and easy to clean but can promote bacteria, especially if it is constantly used as a butcher block. It can be sanded and resealed to manufacturer's instructions as required but can be damaged over time by stains and water. Wood or butcher block is not recommended to be permanently installed on kitchen counters.